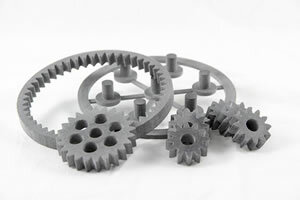 Zacks Equity Research: 3D printer manufacturer Voxeljet AG VJET is set to roll out a new 3D printing system which runs on the new High Speed Sintering (“HSS”) technology this November. The HSS technology is a major step in the metamorphosis of 3D printing from prototyping to large-scale production technology. Not long ago, plastic 3D printed parts were limited to just prototypes. However, with HP Inc.’s HPQ Multi Jet Fusion technology, Carbon’s CLIP process and now Voxeljet’s High Speed Sintering, polymer-based 3D printing is evolving as a way to produce engineering-grade, end-use parts. Consequently, an increasing number of companies are focusing the resources on production instead of prototyping technologies. The new HSS process is akin to binder jetting — Voxeljet’s primary technology. The HSS technology involves an infrared absorbing ink, that is selectively jetted onto layers of plastic powder, which are then exposed to infrared light. The powder melts under the light and forms functional plastic parts with qualities similar to those produced via Selective Laser Sintering, Multi Jet Fusion, or injection molding.